Biogel's Neotech surgical gloves were manufactured in response to the realization that prolonged contact with latex causes skin sensitivity and allergic conditions. The Biogel Neotech is Biogel's first synthetic surgical glove created. Made from chloroprene, now known as neoprene, the Neotech surgical glove is powder-free. When first introduced, the Neotech surgical glove was only considered to by acceptable for use when necessary. Since neoprene is inferior to latex when it comes to tactile sensitivity and comfort, most surgeons continued to use latex surgical gloves. 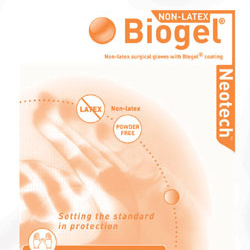 Biogel's Neotech gloves were primarily used by surgeons with latex allergies or when known patients were sensitive to latex. Like the orginial Biogel latex surgical gloves, the Neotech line has an inner coating that allows easy donning even in damp conditions.